May 21, 2017 November 5, 2017 by Nils Oudhuis . Load management is something that every physiotherapist has to become familiar with. He is a keen blogger and posts regularly on sports physio and strength and conditioning topics. He has a website, which you can find some of his previous blogs. And he is very active on social media and can be found at Facebook, twitter (@mickwhughes) and Instagram (@mickhughesphysio). Last year I attended the “Mastering Load Symposium” in Melbourne and I found it to be one of the most valuable weekend courses that I have ever attended. The quality of presenters was world-class, and the value of the information delivered was such that it crossed all age groups and levels of sporting ability/fitness levels. For example, unlike a weekend course on the shoulder where you only get to apply your new found knowledge to patients with shoulder pain, load management can be applied to each and every patient/client that walks into your room. Furthermore with the amount of high quality research being published in the area, it is very clear that load management is evidence-based physiotherapy practice, and is – in my opinion – more valuable than manual therapy, and it should be part of every patients injury management plan (reference). Internal load – eg. heart rate (HR), rate of perceived exertions (RPE) and/or well-being scores. OK, so the ACWR is all nice to know but what does all that mean? Well, researchers have found that there is a “sweet spot” to have a reduced risk of non-contact soft tissue injuries, and that “sweet spot” is a ACWR between 0.8 – 1.3. As you can see, the training plan listed above lies within the “sweet spot”. 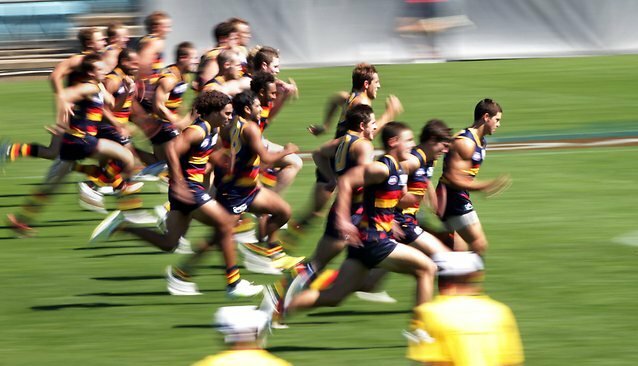 As you should also be able to see is that with a ratio of 1.11 there is a bit of wriggle room for your training to be increased over the next month to get more out of your athlete. However, if you haphazardly increased the training intensity for week 5 and the load for that week was 5000 units, you would find that you would get a ACWR of 5000/2250 = 2.25 – and your athlete would be in a whole lot of trouble. Don’t increase training loads greater than 10% from week to week. If unavoidable spikes in training occur, dont panic! 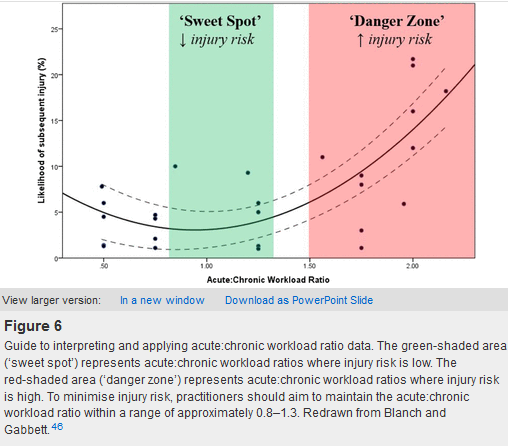 Reduce the training loads over the next 1-4 weeks to get the ACWR back into the “sweet spot”. I hope I have explained it well enough for you all to understand and given the concept of ACWR justice to the original authors. 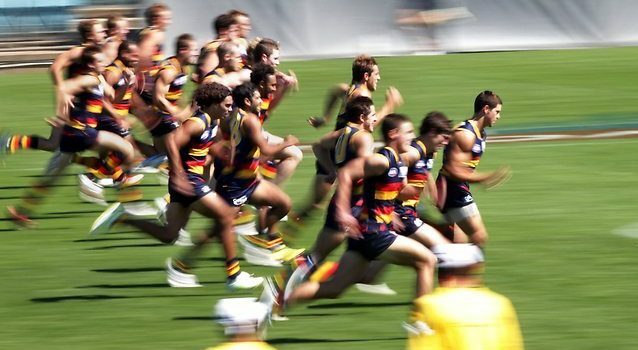 The next blog will up later this week on the effects of de-training and risk of subsequent injury. As always please feel free to share this blog to people that may find this beneficial/useful, and please let me know if I have missed the mark, or have any questions on this topic.